More than a year after Uttarakhand witnessed one of the worst natural disasters in the country, several flood-hit areas in the state are still waiting for government assistance. One such village is Sumdum in Pithoragarh district. The 120-odd families there live in the fear that floods will strike again this monsoon—and this time completely wipe out the village. Sumdum, which falls in Dharchula subdivision, is surrounded by snow-capped mountains and two streams, Ragyani Gad and Khari Gad. The mountains developed cracks during the floods in July last year when it rained for seven consecutive days. Village residents say that because the state government has not undertaken restoration work, the mountains are prone to landslides. They fear the village will disappear if it rains for just four consecutive days this monsoon. Ask them about government assistance and they say that not even the patwari, who assesses the damage for government relief, has visited the village. Residents say the Down To Earth reporter was the first outsider to visit the village after the floods. Basant Kot, another village in Pithoragarh district, has a similar story. The road connecting the village in Munsiary subdivision got washed away during last year’s floods. As a result, residents say several people have lost their lives while travelling to nearby villages for ration. Police records suggest six people from Dharchula and Munsiary subdivision have died between March and April 2014 while travelling to other villages. Despite the state government’s claims of speedy rehabilitation, Down To Earth found at least eight other villages that have received no support from the state. They are Goripar, Ukheti, Bothi, Bagnidhar, Phapha, Khet, Khotila Byasnagar, Chhori Bagar. Nevertheless government officials are patting themselves for doing good work. In the last week of April, the Pithoragarh district magistrate’s office issued a press release with photographs of a team visiting Sumdum. Regional newspapers published articles praising the district magistrate for “accomplishing the impossible”. It turns out the team never visited Sumdum. It only reached Teejam, which is 7 km from Sobla, the last village in the area with road connectivity. Sumdum is another 11 km from Teejam. “Every official who claims to have visited Sumdum has only walked till Teejam. Even the patwari went till Teejam and returned. We do not even exist for the government,” says Ram Singh Dami, a 68-year-old resident of Sumdum. If they were really concerned, they could have used helicopters to reach us, he adds. To protest government apathy, the people of Sumdum boycotted the Lok Sabha elections this year. The state government has carried out rehabilitation efforts only in popular areas that attract tourists. As a result, the highways leading to the shrines of Kedarnath, Badrinath, Yamunotri and Gangotri (char dham) offer a smooth ride to tourists and mediapersons. “Quite cleverly, whatever rehabilitation work the government has undertaken is on the tourist circuit. The chief minister knew that with the beginning of the pilgrimage season, media focus would be back on Uttarakhand,” says Gajendra Rautela, co-convener of non-profit Prakriti. He adds that the remote areas away from the tourist circuits are still in pathetic condition. Rautela points out that the work on the char dham areas began at breakneck speed only two months ago. 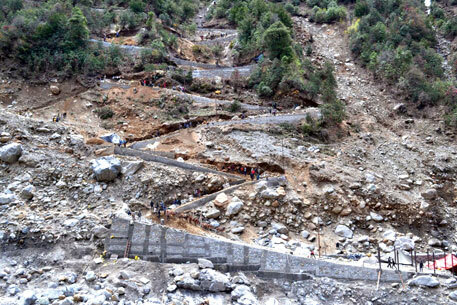 Sources in the state government say officers were relocated from the “less popular” disaster-hit areas such as Pithoragarh to the char dham region to complete rehabilitation work. However, several villages in the popular Badrinath and Kedarnath areas have also received stepfatherly treatment from the government. Residents of Jhoolar Gaon, Khiron Gaon, Benakuli, Arori, Patori, Patgasi and Pinola villages near Badrinath, along with Pulna and Bhyundar villages near Hemkunt Sahib, complained of little assistance. “The government gave me Rs 8,000 as compensation for the 20 small apple farms I lost during the floods,” says Laksman Singh from Benakuli, who now runs a makeshift tea stall. He claims he walks 8 km to Binayak Chatti village to buy rations. “My village is still threatened by erosion. The government has hardly done any flood protection work,” he adds. RTI activist Govind Singh Danu of Sumdum alleges money is being wasted on substandard work. In reply to an RTI filed by Danu on rehabilitation work in Sumdum, the state government said it is spending Rs 2 lakh to construct a wooden bridge and Rs 8 lakh for a cemented bridge. “But the wooden bridges that have been constructed are substandard and should not cost more than Rs 20,000. This is happening because of fund mismanagement,” he alleges. Ravi Chopra of Dehradun-based advocacy group People’s Science Institute blames the absence of a resettlement and rehabilitation policy in the state for the poor situation. “As a result, every time there is a disaster, the state starts from scratch,” he says. According to official figures, about 600 affected villages had to be relocated after the June floods. State data shows another 550 villages vulnerable to floods. But Chatikhal village in Rudraprayag district is the only place that has been partially relocated. The state government blames lack of land for the delay in relocation, a claim social activists such as Purushottam Sharma refute. “The state that is cribbing about lack of land for relocating vulnerable villages has been generous in distributing land to corporates, builders, religious organisations and politicians. The state government gave away about 100,000 hectares to different private organisations during former chief minister Vijay Bahuguna’s reign,” alleges Sharma. Activists are also questioning the intentions of the state government. Uttarakhand received over Rs 276 crore as assistance from different sources for rehabilitation after the floods. “The state cares more about tourists than the people who live here. The monsoons are here and we are waiting for death. Where did the crores of rupees go?” asks Govind Singh Danu.